Period Furniture Conservation can help you keep the furniture and wooden objects in your care stable, historically faithful and esthetically presentable, whether you own them or have curatorial responsibility for them. There are a number of services we can offer. Here's a sampling, by category. Utilizing argon, an inert gas, controlled atmosphere treatment, or anoxic fumigation as it was previously known, is a proven method of removing biopredation. It is safe and non-toxic to humans, leaves no residue, and is harmless to most art objects. Wooden objects such as furniture and panel paintings are excellent candidates for this approach, as well as textiles such as costumes, embroideries, tapestries, rugs, and carpets. Natural history collections or taxidermy models can also be treated with this method. Treatments last approximately six weeks and objects large or small, or whole collections can be treated onsite or in our facility. Visit our sister company website Kensington Preservation, LLC for more information about this process, and our numerous treatments. 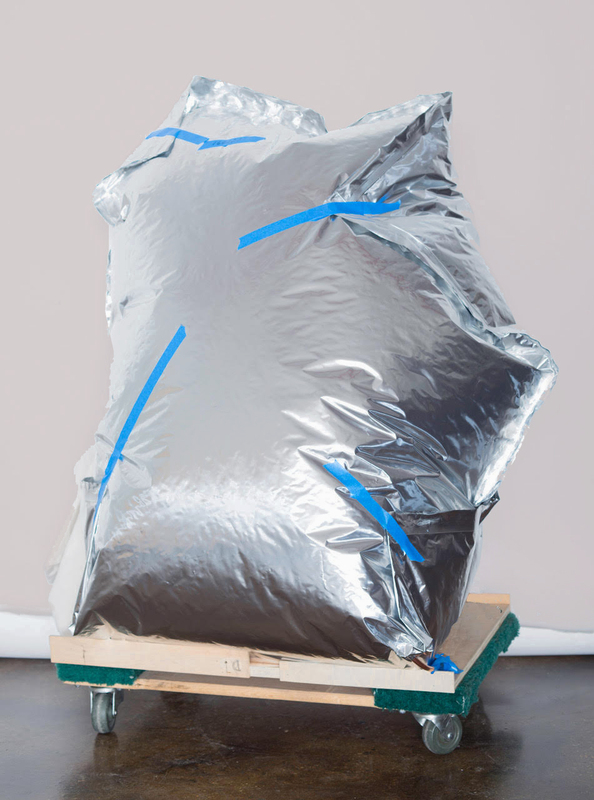 Anoxic fumigation of a contemporary art object. Building a great collection takes a tremendous investment of time, effort and money. Preventive conservation is one of the best ways to protect your investment. Period Furniture Conservation can perform a collection survey to identify the condition of each object in your collection and address emerging conservation issues before they become real problems. Many of our clients rely on us to perform periodic inspections and provide maintenance care on a regular basis. 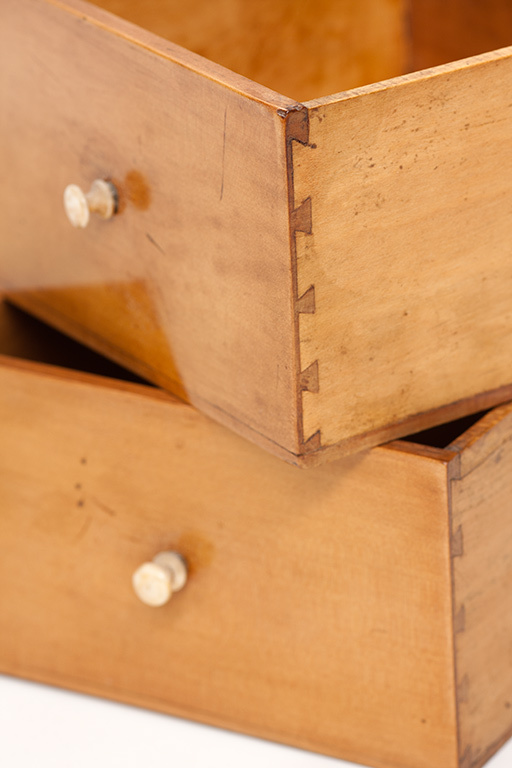 Before you buy — or sell — your furniture or wooden object, you want to be certain that it is exactly what is advertised. While we do not "authenticate" objects, we frequently provide thorough technical examinations, detailing the materials and methods that were used in their creation as well as their present condition. We also provide scientific testing of coating surfaces, such as solvent solubility, cross-section analysis, microscopic wood identification analysis, x-ray fluorescence of furniture mounts, and ultraviolet light surface surveys. Our reports are always confidential to our clients. —Oil and spirit varnishes, French polishing, wax polishing: These historically important coatings and methods of application were used for centuries to protect the surface of wooden objects in Europe and the Americas. We recreate these finishes — or rescue the underlying remnants of them. —Oriental Lacquer: urushi lacquer has been used as a coating on furniture and wooden objects in Japan, China and the Southeast Asia since the Neolithic period. It is derived from the sap of the Rhus genus, the same genus that also includes sumac and poison ivy. This coating is among the most difficult to work with, and the resin is toxic to most individuals. It is typically not understood by many "restorers." We possess the expertise to identify it, we know its properties, and how to treat what is missing or degraded. —European Lacquer: One common term for this lacquer is Japanning. Unlike urushi lacquer, it is typically composed of a mixture of various resins. This is a unique category of coatings, representing the attempts of European craftsmen to imitate Oriental lacquer. Furniture objects with this coating are highly prized by collectors. Many surfaces incorporate gilding and silvering as well. We consider the treatment of these objects a particular strength of our firm. —Polychromy: Over the centuries, painted designs, whether figurative, floral or geometric, have formed an important part of furniture and wooden object decoration. When the original surface is damaged, we can recreate a surface with similar visual properties. Gilding is a highly specialized, delicate and time consuming — not to mention expensive — form of surface decoration. There was a time when the cost of a gilded frame was greater than that of the painting itself! 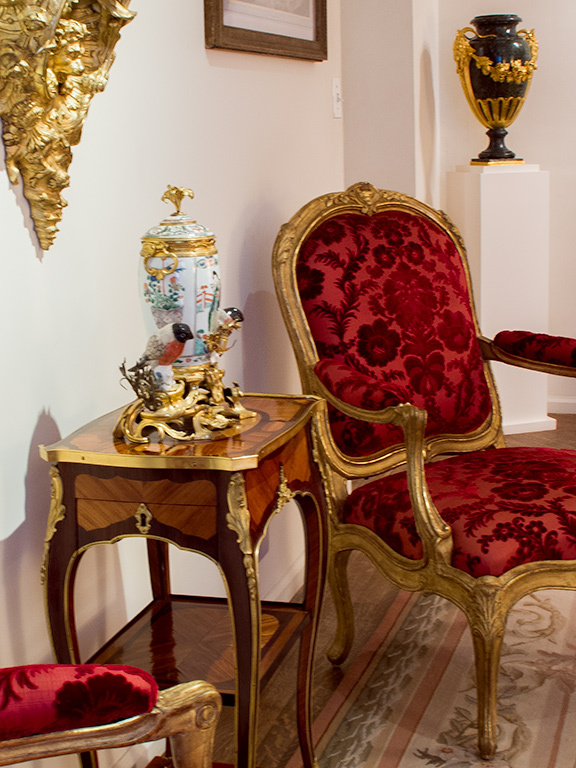 Addressing historic gilding, whether water or oil gilding, on furniture or on frames, requires sensitivity to the color and the reflective properties of the remaining original gilt. There is also the delicate process of re-cutting of the gessoed surface, which forms an area of specialization onto itself. We have superb skills in these areas, as witnessed by many examples of our work at notable cultural institutions in New York City, including the Metropolitan Museum of Art, and in numerous private collections. Damage to marquetry, carvings and structural elements occur over time from variations in humidity, animal predation, light and just plain use. We recreate structural and surface integrity as needed, from stabilizing a joint, to re-carving missing or damaged elements with modern reversible techniques, to delving into the nuances of an elaborate marquetry surface. 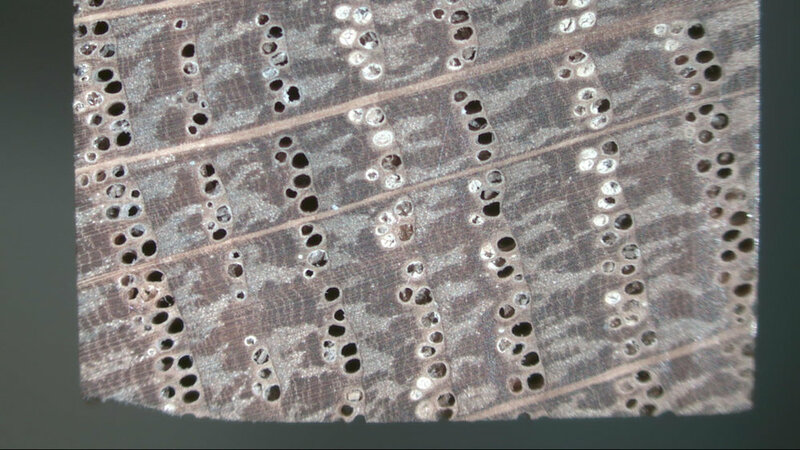 Additonally, we can perform microscopic wood examination to aid in the identification of a furniture object. Picture frames are one group of wooden objects that frequently receive little attention from most educated laypeople. Nevertheless, a period frame in good condition can greatly impact the perception of the painting itself. Our intimate knowledge of the historic coatings' over gilding, their patinas, and the methods of frame construction and decoration make us the ideal partner for enhancing the painting's impact and presence. Proper care of furniture begins with understanding and appreciation of the unique characteristics of each piece of furniture within its surrounding environment. Properly maintained humidity, temperature, and light levels will go a long way towards keeping the condition of your objects stable, and will also increase their serviceable life. Increasingly, sophisticated private collections seek to recreate the same ideal conditions found in museums. We recommend, monitor and direct the installation of temperature and humidity control systems. Environmental control systems can vary significantly, depending upon the objects in your collection. For example, a collection of gilded furniture would require different environmental conditions than a collection of pastel drawings. No one wants the unexpected to happen — particularly to a favored or valued piece — or collection — of furniture. We have extensive experience in treating transit damage, from broken legs and large gouges to small dents. When disaster does strike however, a fast response can preserve your collection from additional damage. On more than one occasion we have arrived onsite quickly, assessed the situation and recommended emergency procedures to stabilize the objects. We also provide onsite evaluations, photographic documentation, detailed written reports and damage and loss surveys that will be necessary in getting your insurer to honor your claim. Call us for a consultation at 212.255.7426.